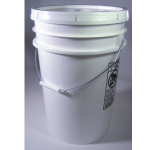 6 Gallon White Plastic HDPE Pail with Metal Handle PHPW6GAL-PC – Auberst, Inc. Simply The Best ~ Your source for container supplies, including cans, jars, bottles, pails, drums and sprayers. Copyright ©2016, all rights reserved.